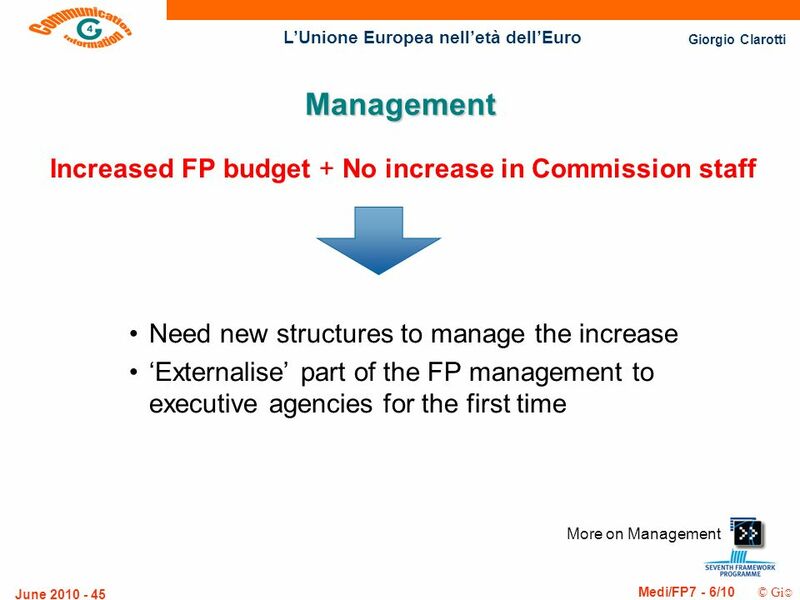 Giorgio Clarotti Medi/FP7 - 6/10 © Gi LUnione Europea nelletà dellEuro June 2010 - 1 LUnione Europea nelletà dellEuro PROGRAMMI E STRUMENTI FINANZIARI. 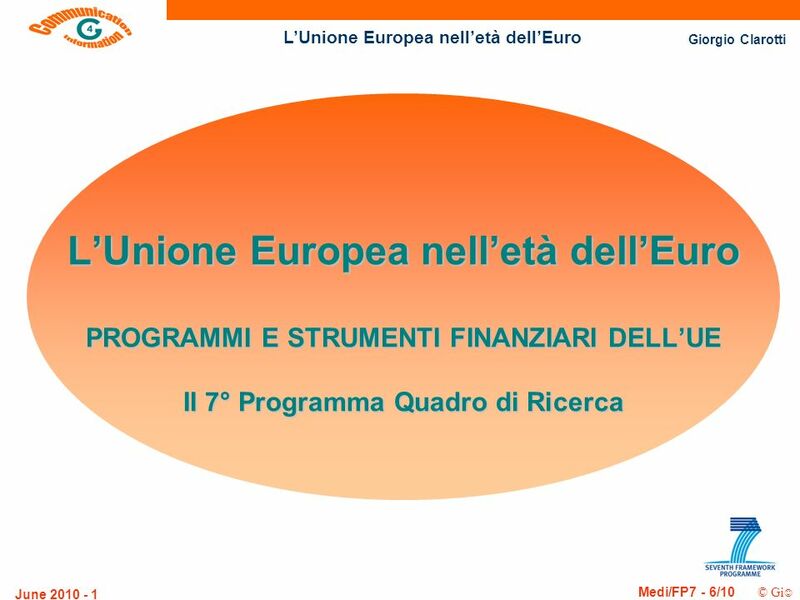 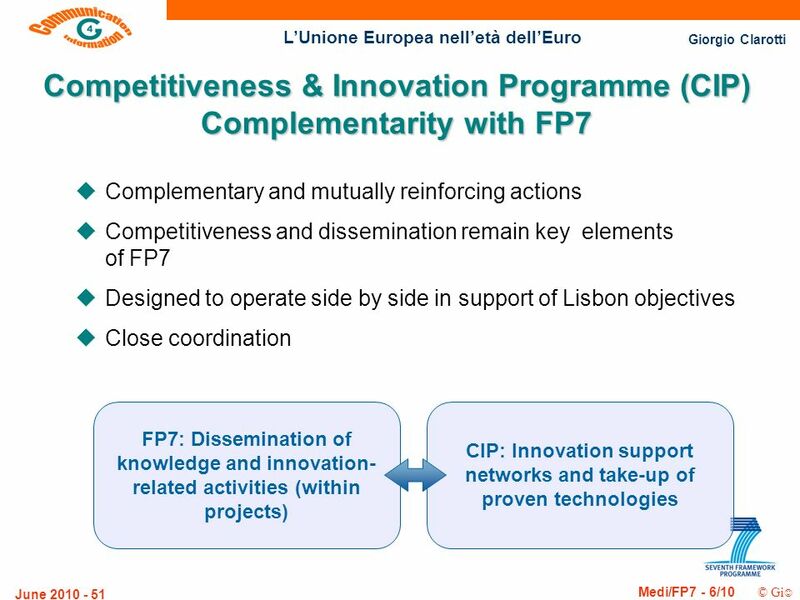 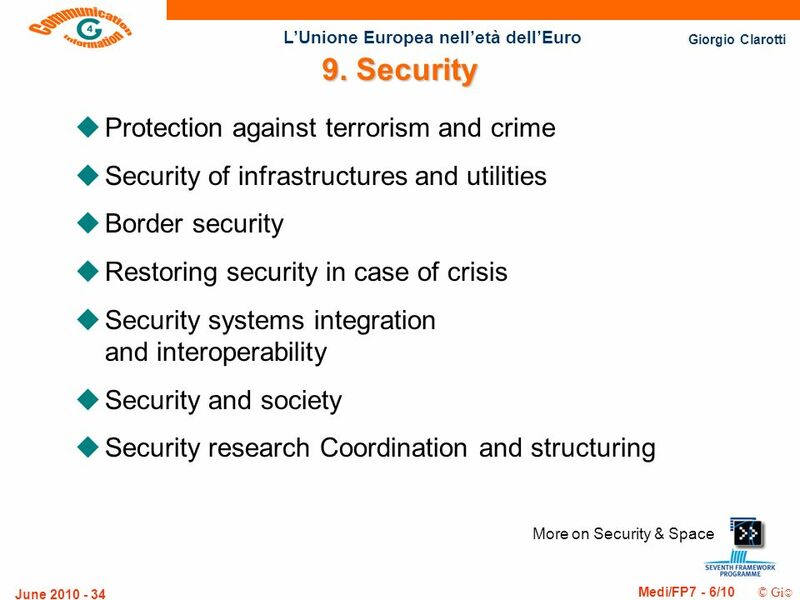 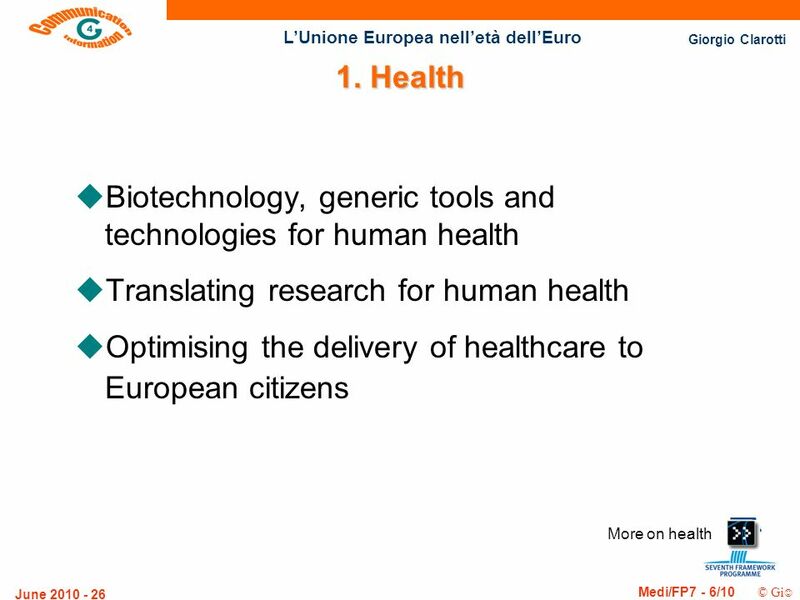 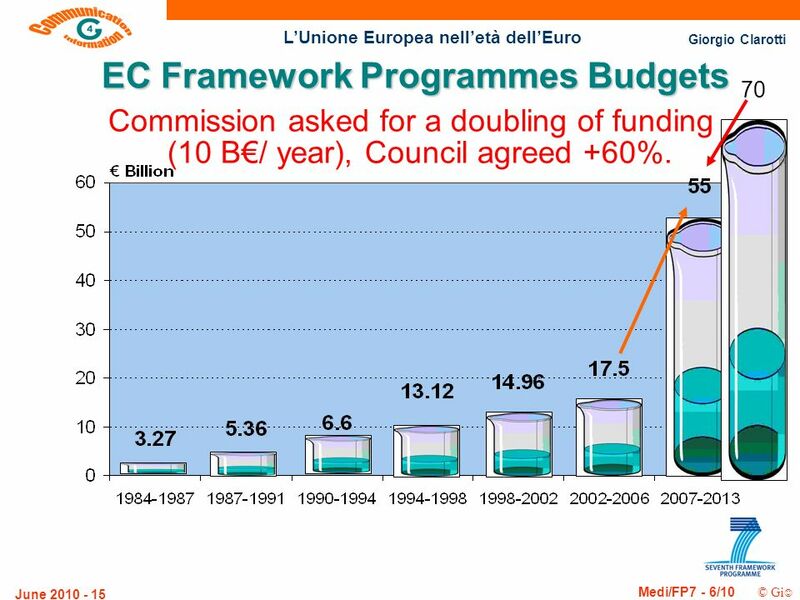 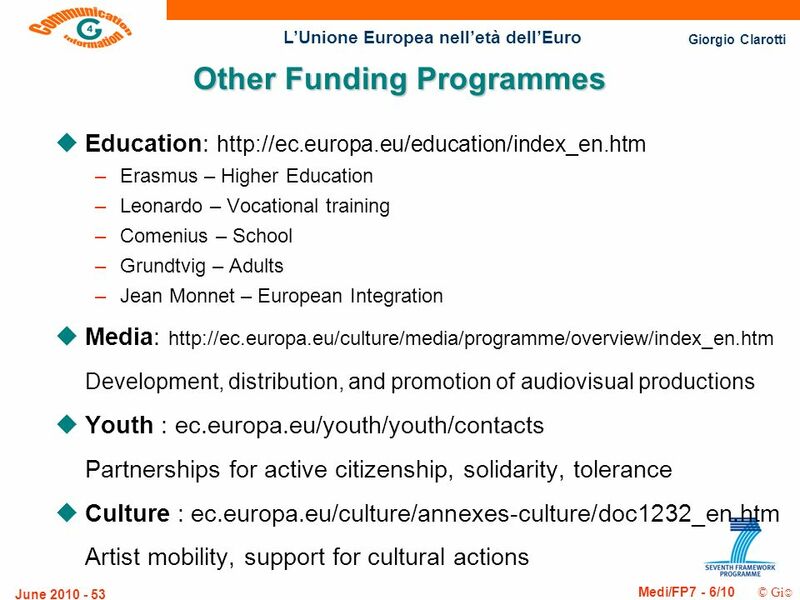 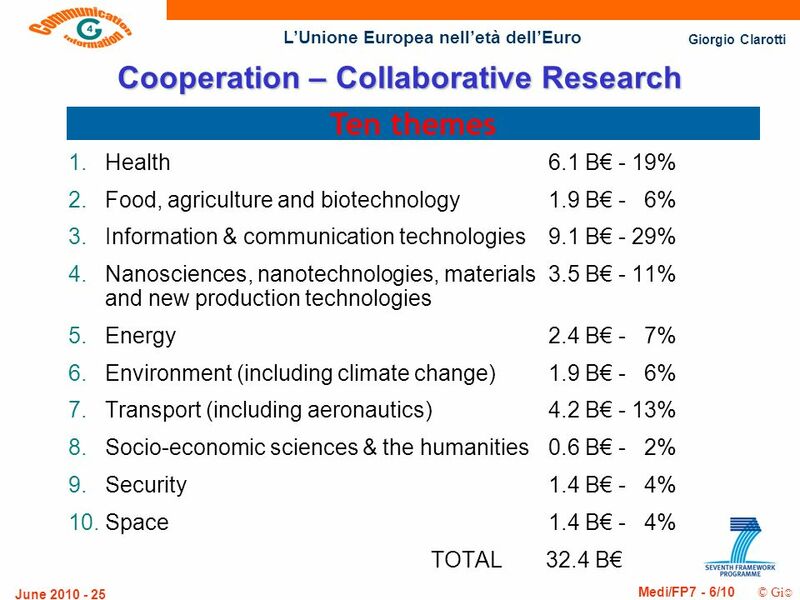 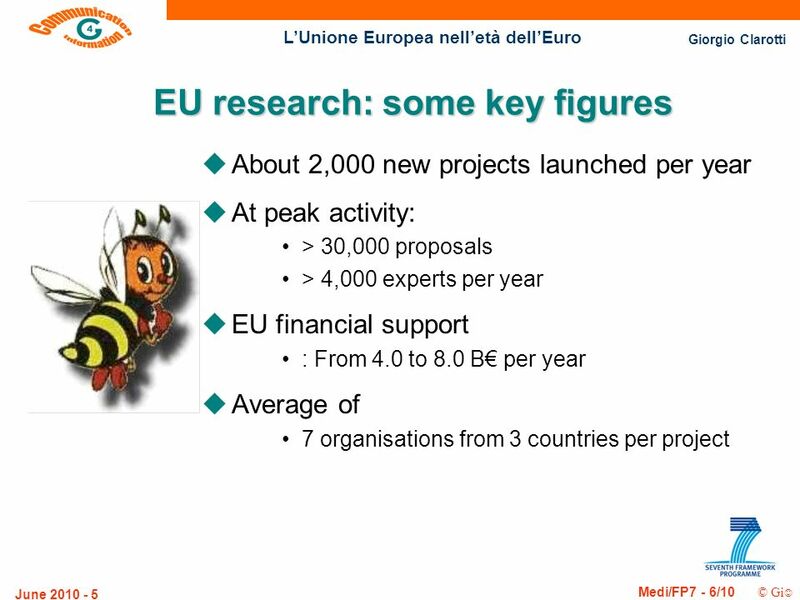 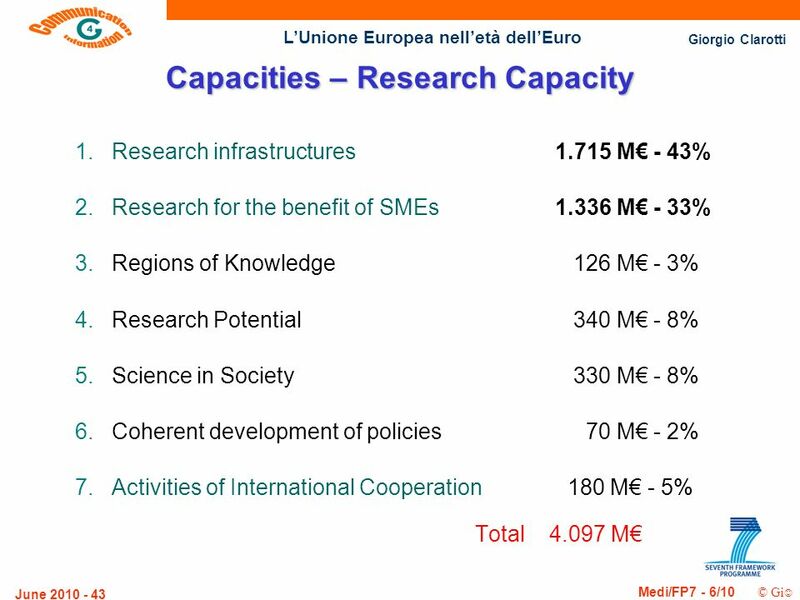 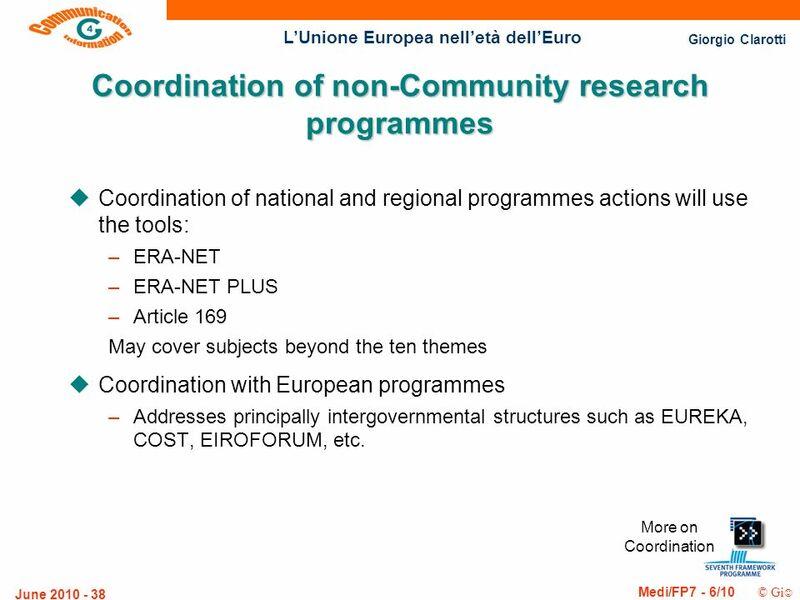 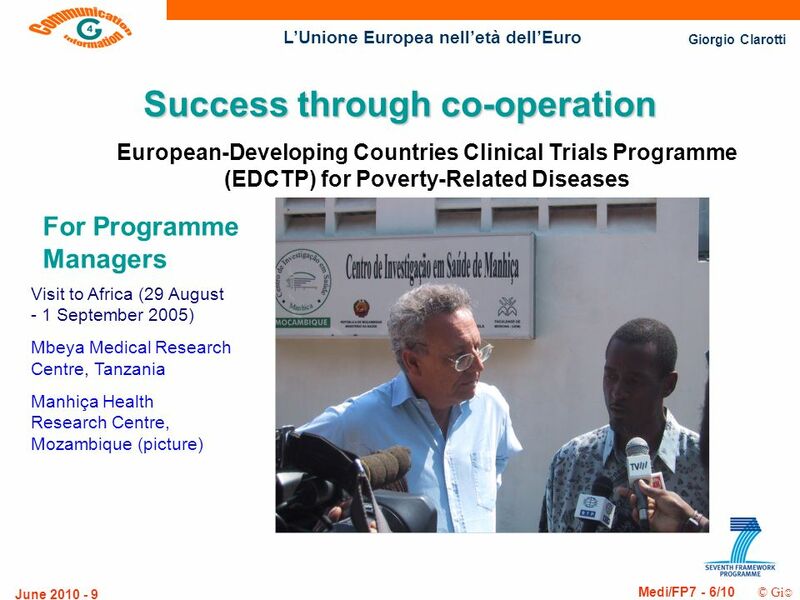 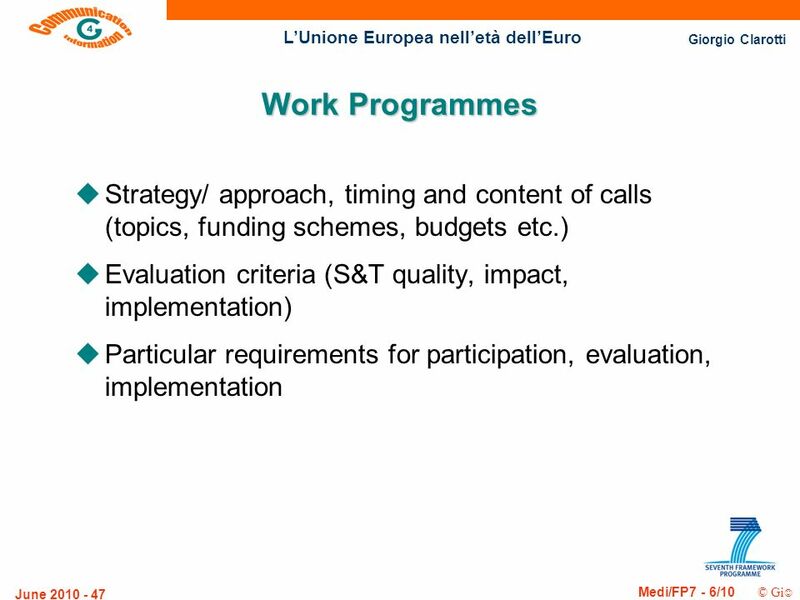 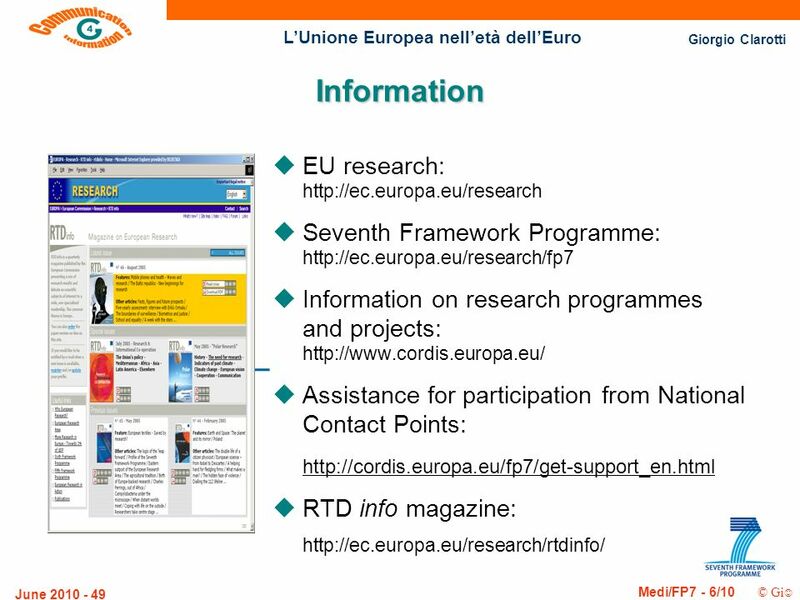 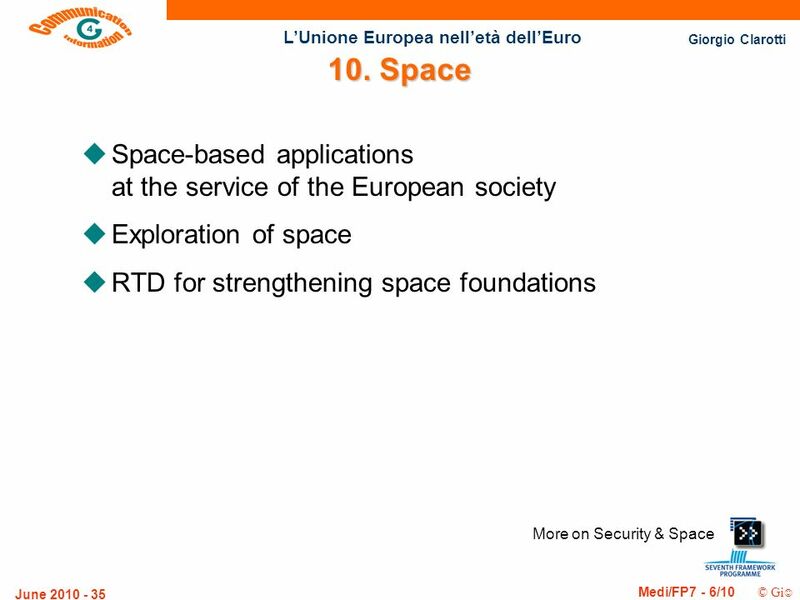 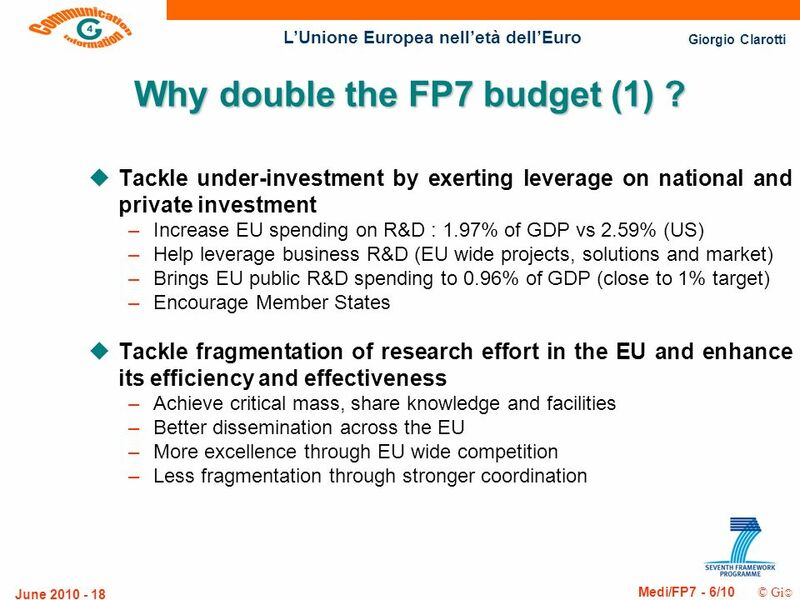 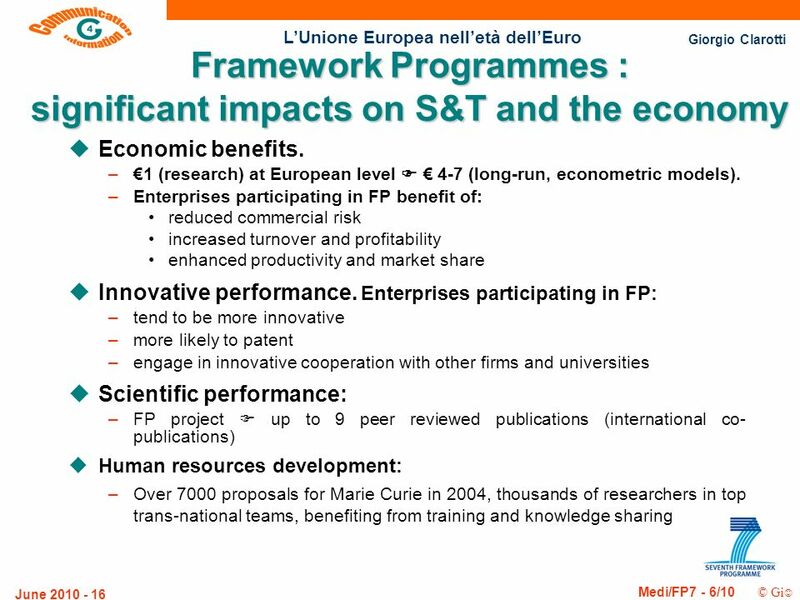 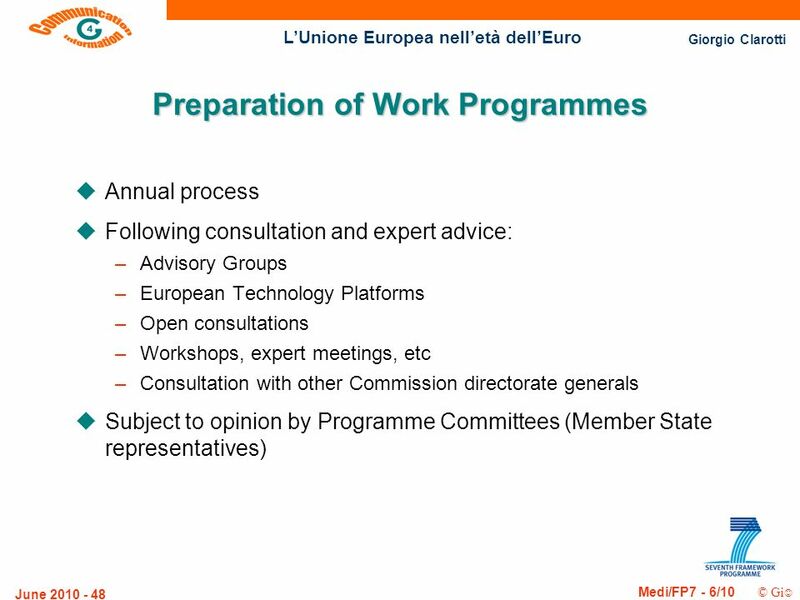 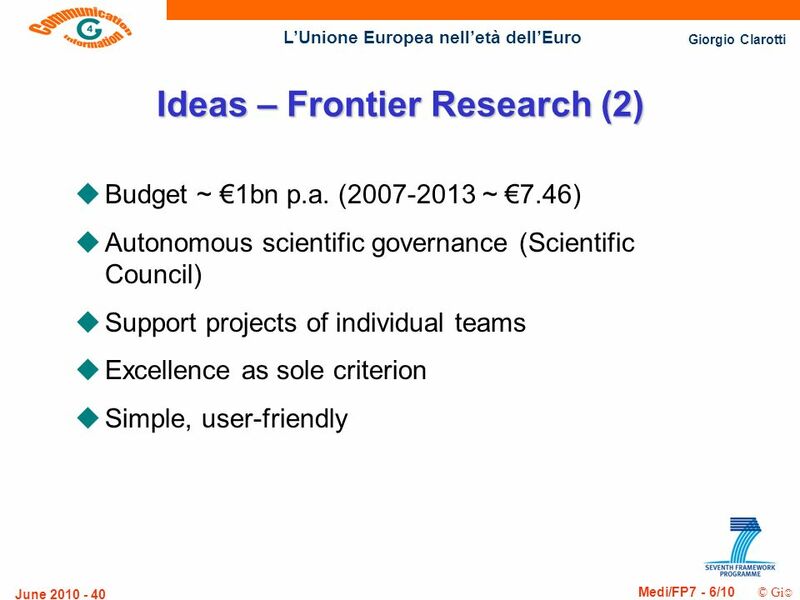 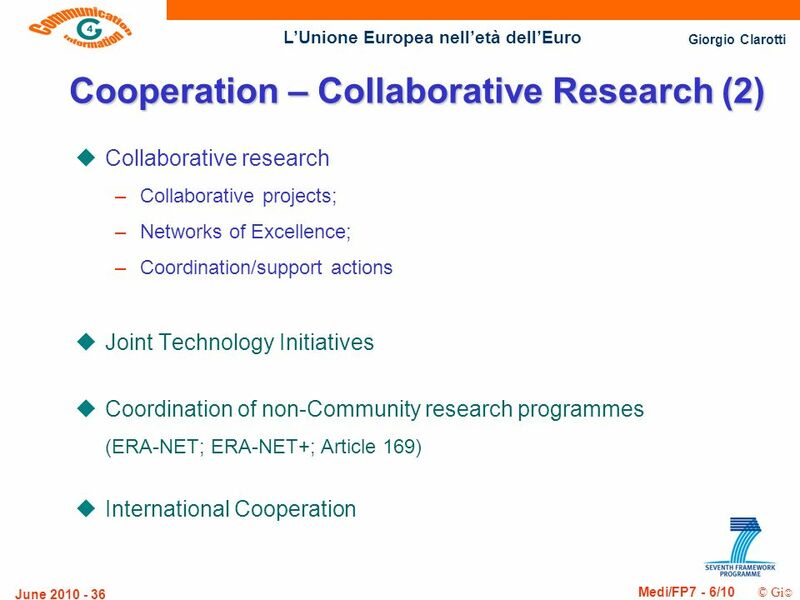 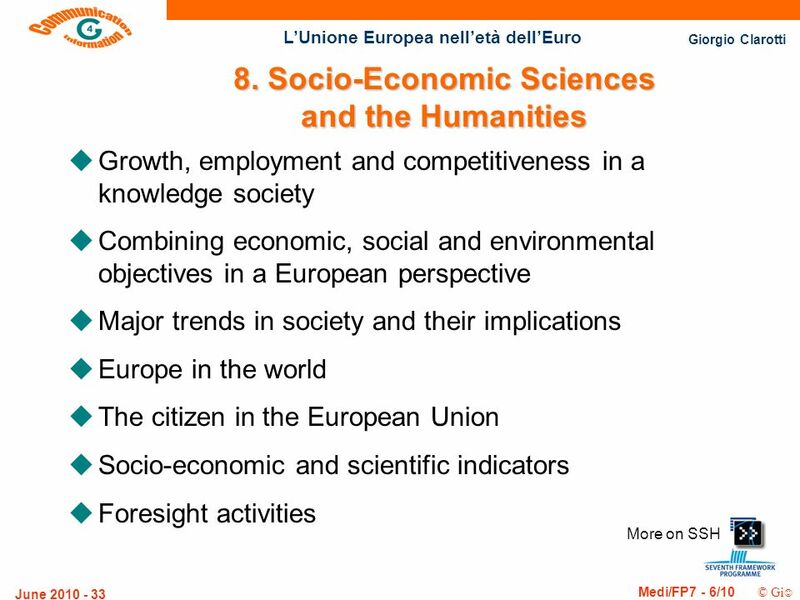 15 Giorgio Clarotti Medi/FP7 - 6/10 © Gi LUnione Europea nelletà dellEuro June 2010 - 15 EC Framework Programmes Budgets 70 Commission asked for a doubling of funding (10 B/ year), Council agreed +60%. 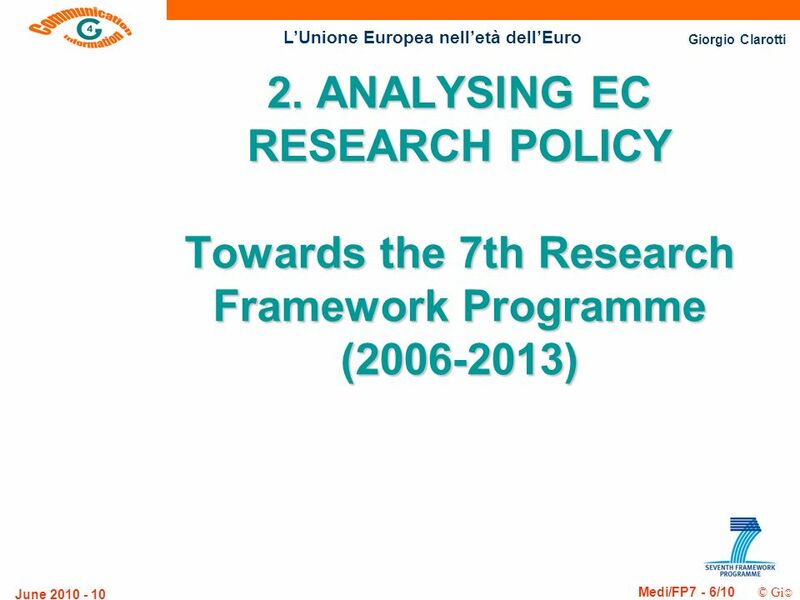 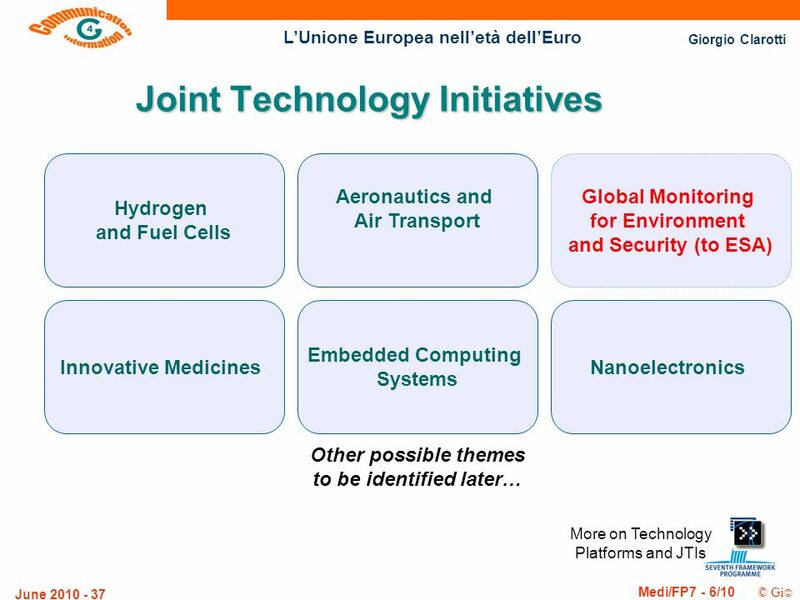 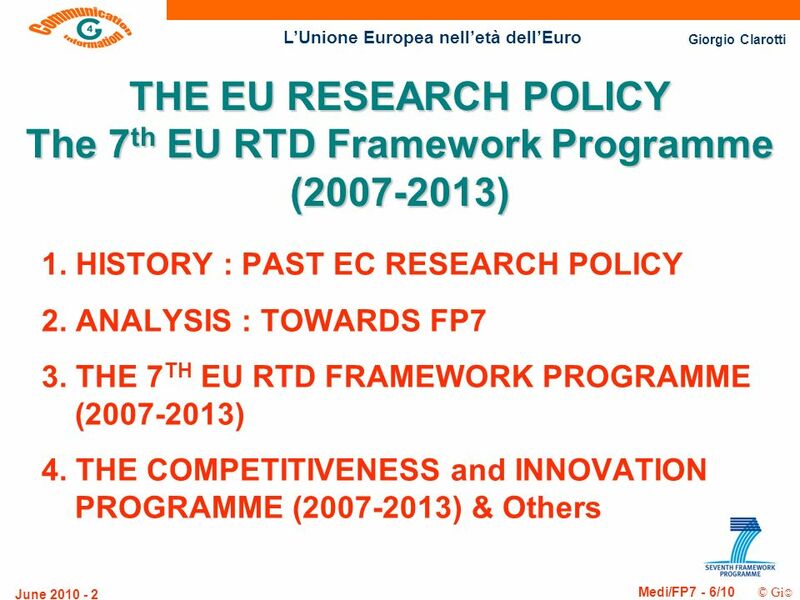 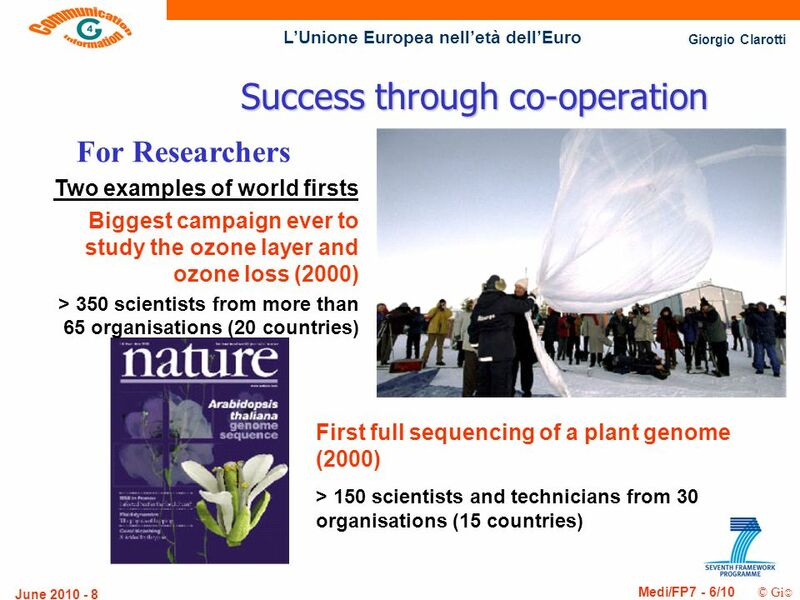 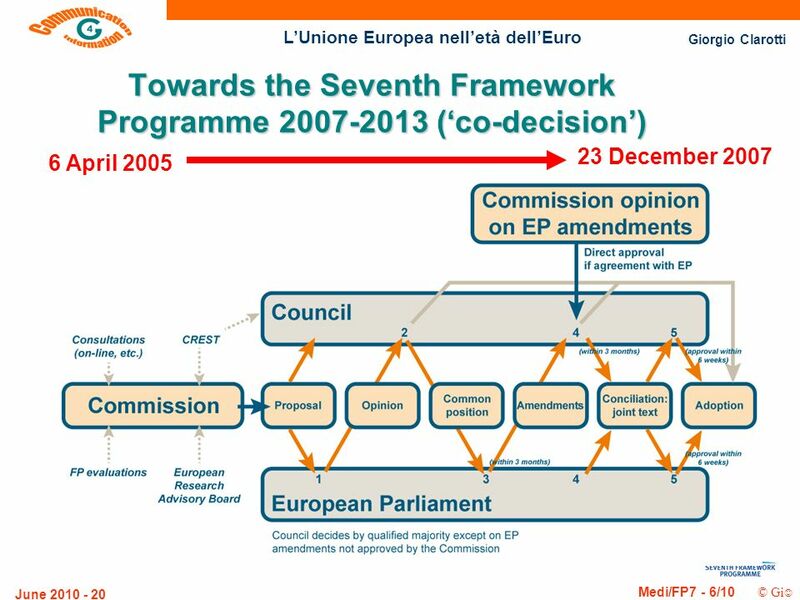 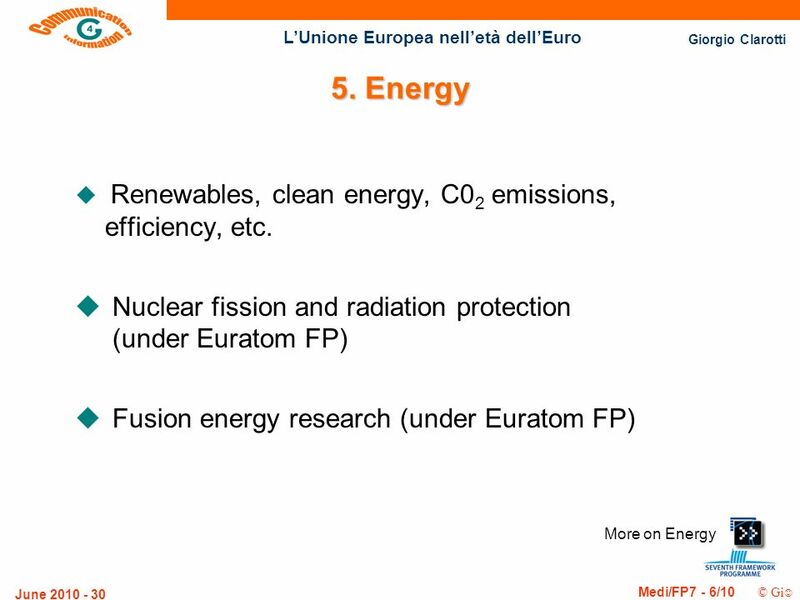 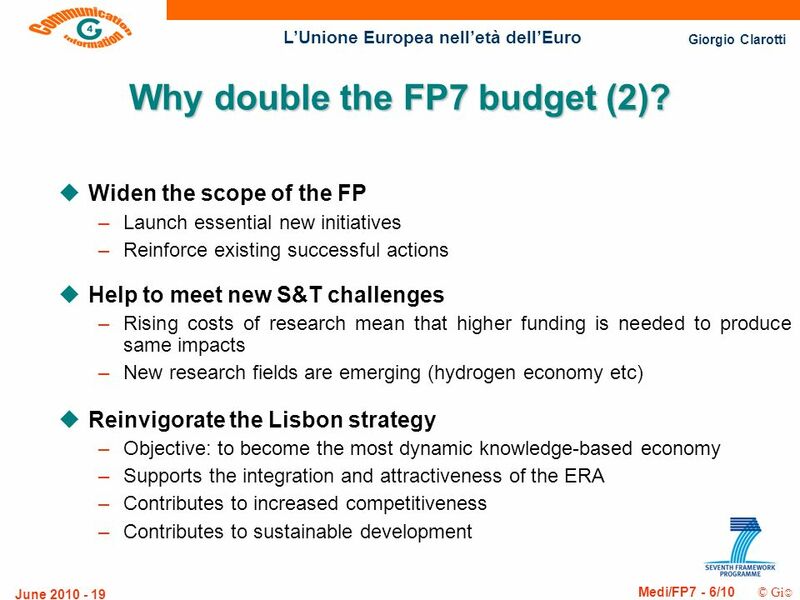 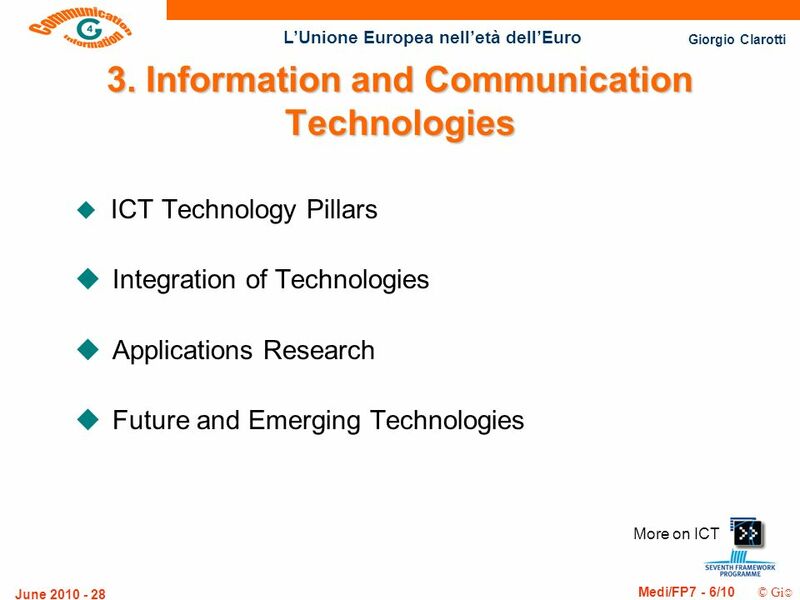 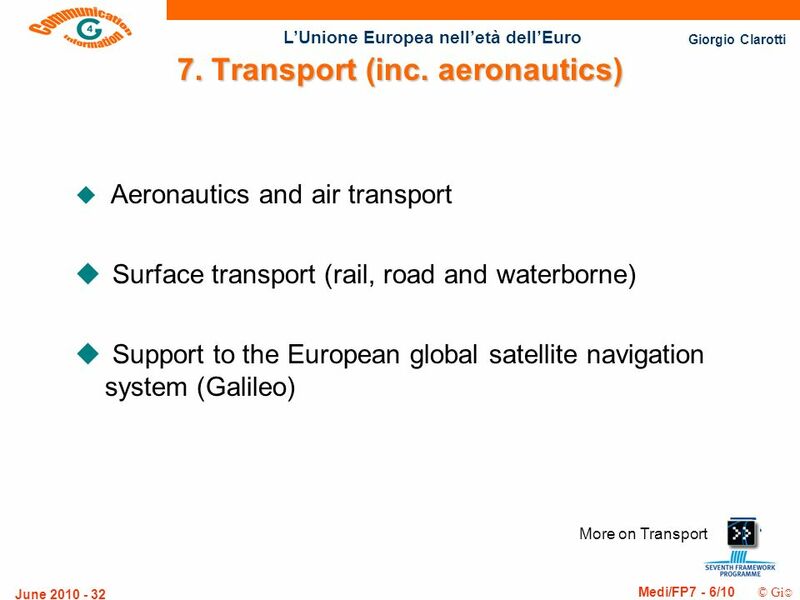 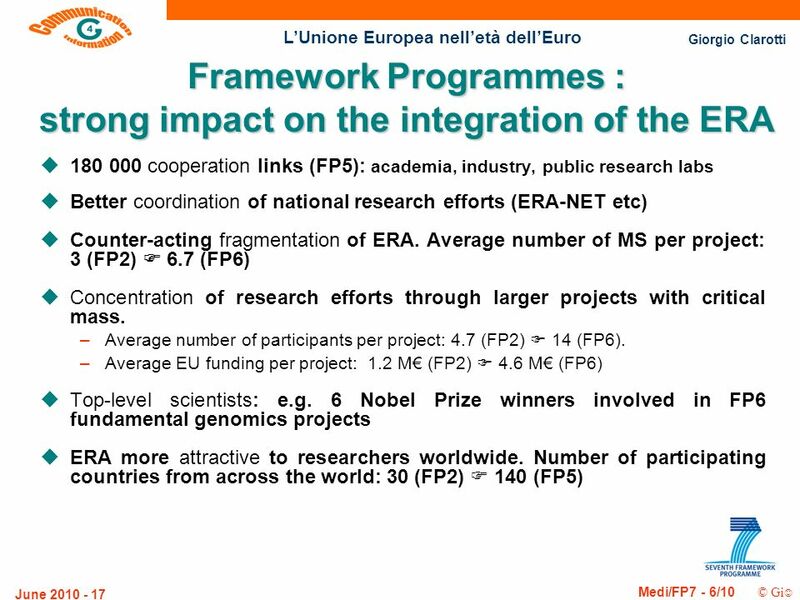 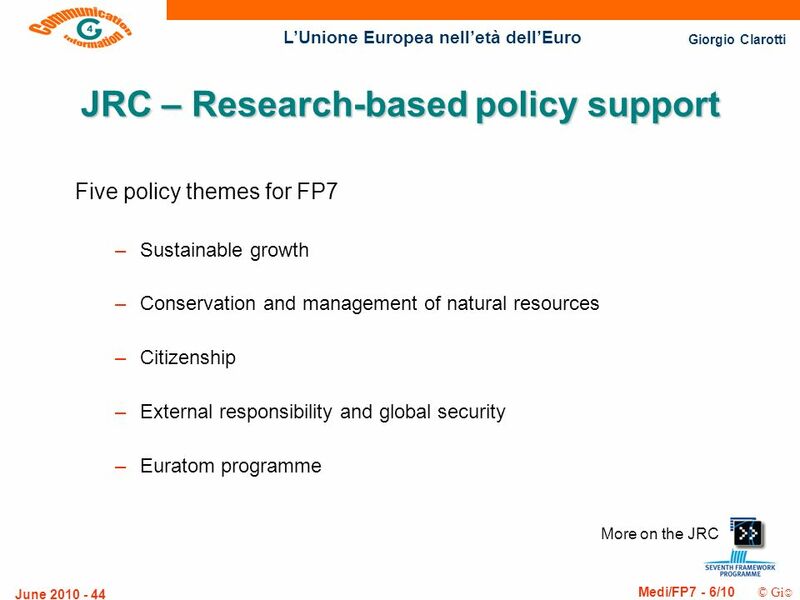 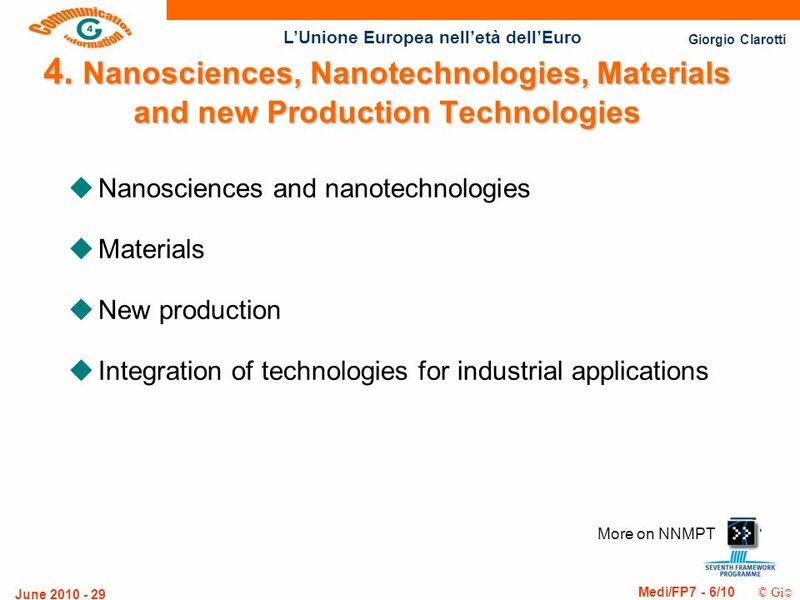 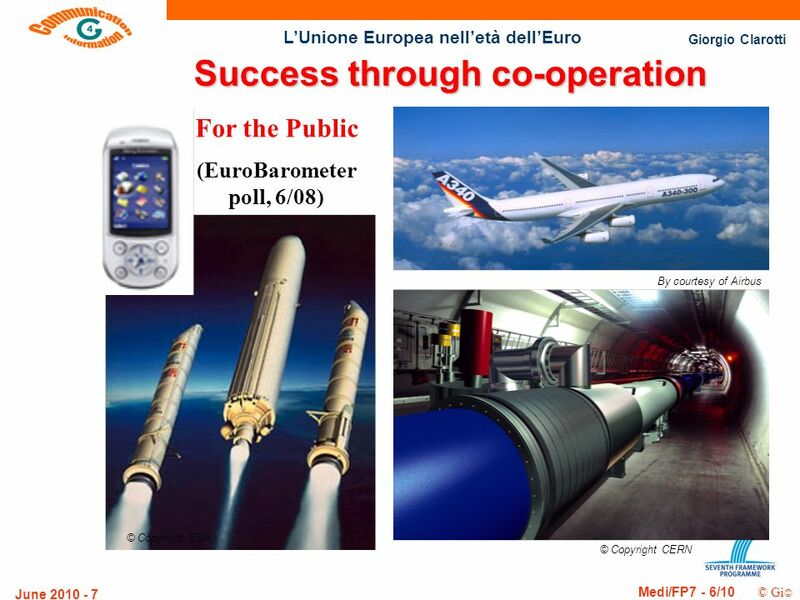 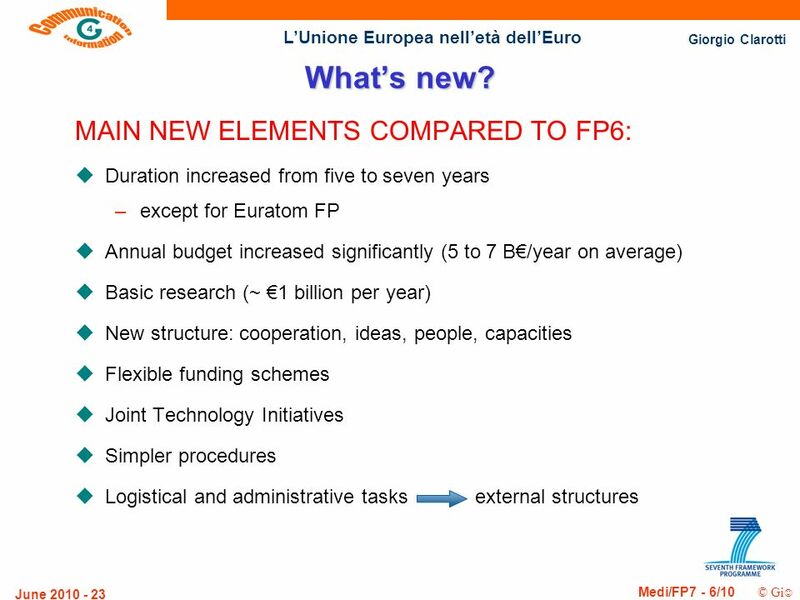 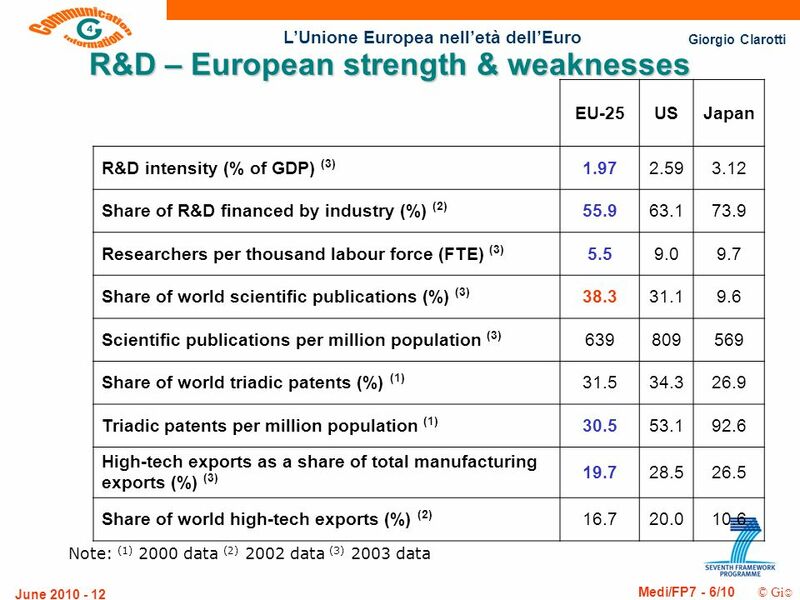 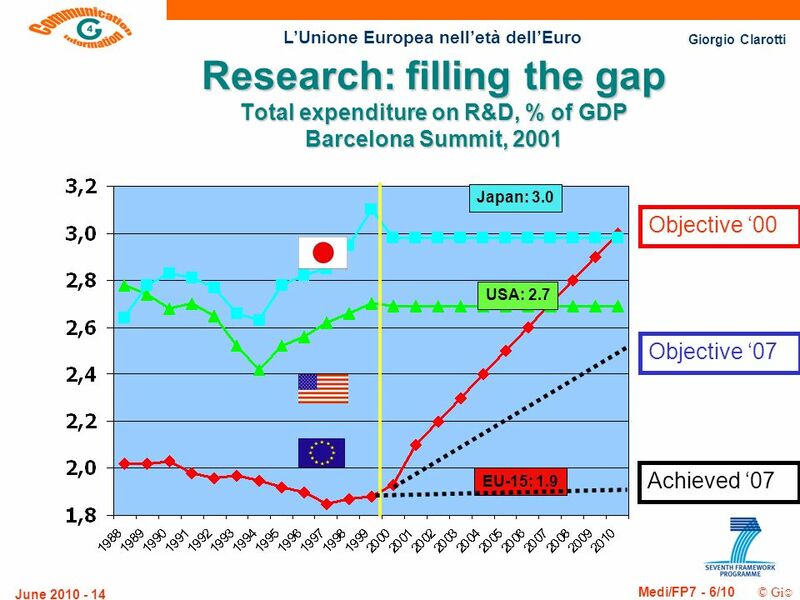 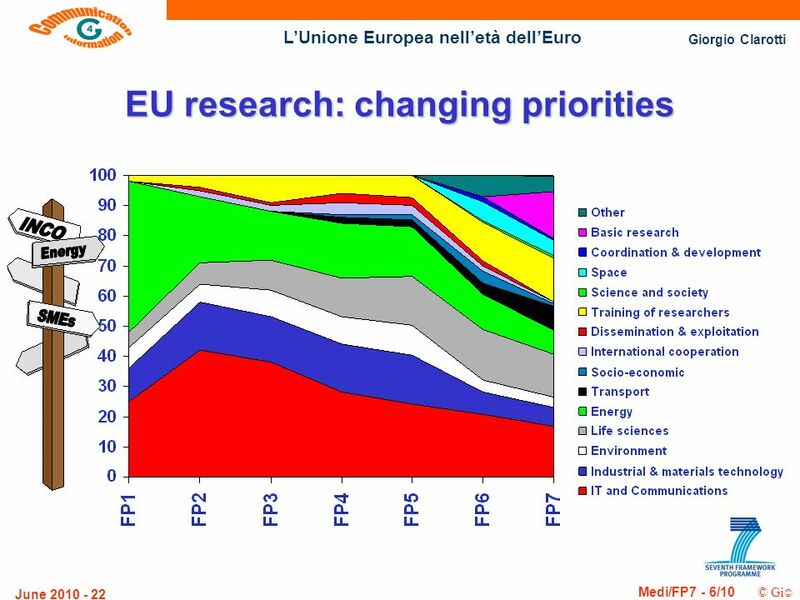 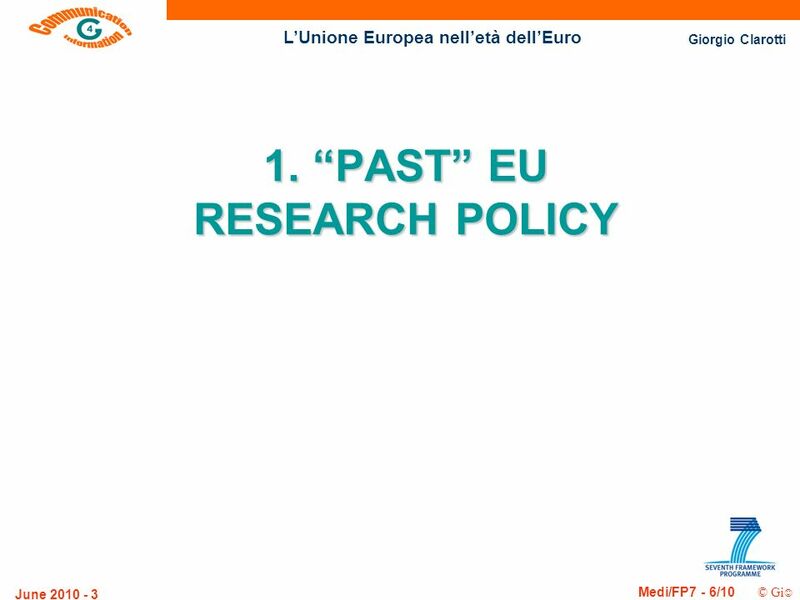 23 Giorgio Clarotti Medi/FP7 - 6/10 © Gi LUnione Europea nelletà dellEuro June 2010 - 23 MAIN NEW ELEMENTS COMPARED TO FP6: uDuration increased from five to seven years –except for Euratom FP uAnnual budget increased significantly (5 to 7 B/year on average) uBasic research (~ 1 billion per year) uNew structure: cooperation, ideas, people, capacities uFlexible funding schemes uJoint Technology Initiatives uSimpler procedures uLogistical and administrative tasks external structures Whats new? 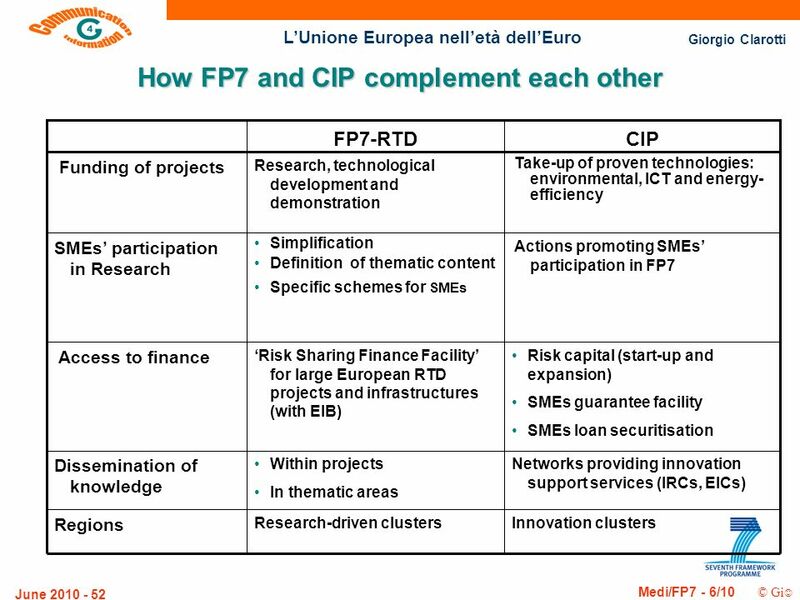 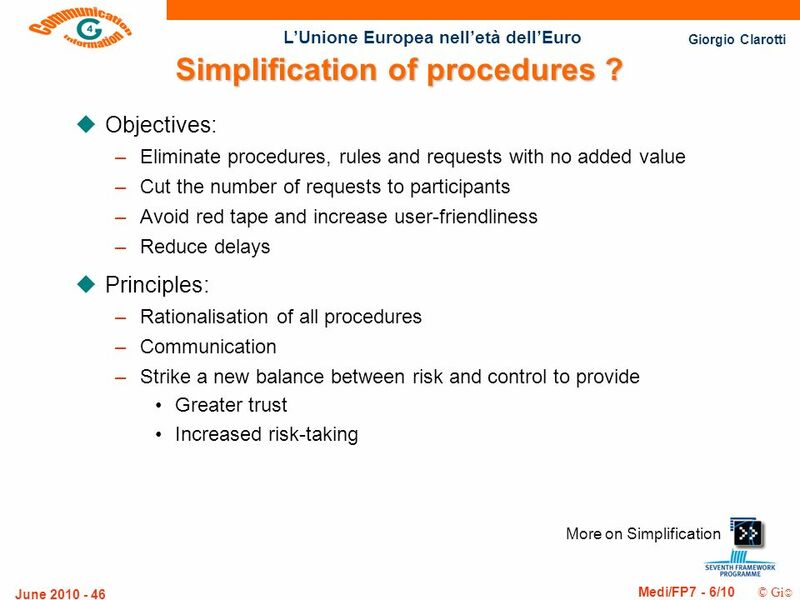 Download ppt "Giorgio Clarotti Medi/FP7 - 6/10 © Gi LUnione Europea nelletà dellEuro June 2010 - 1 LUnione Europea nelletà dellEuro PROGRAMMI E STRUMENTI FINANZIARI." 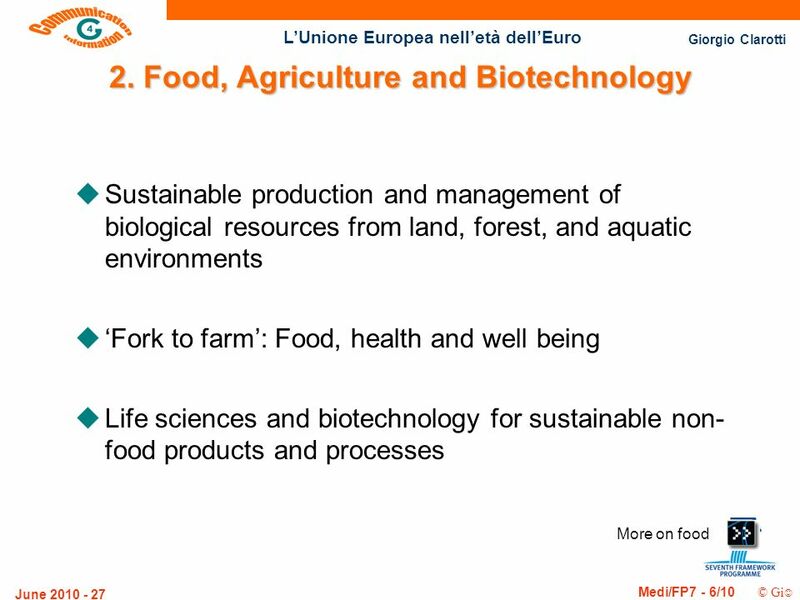 1 Food, agriculture and biotechnology in the 7 th RTD Framework Programme Dr. Klaus-Günther Barthel Directorate for Biotechnology, Agriculture and Food. 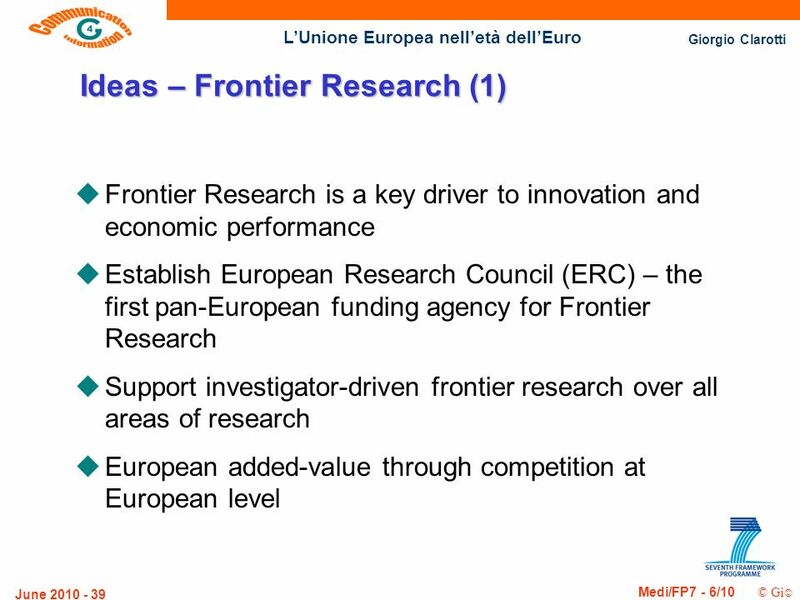 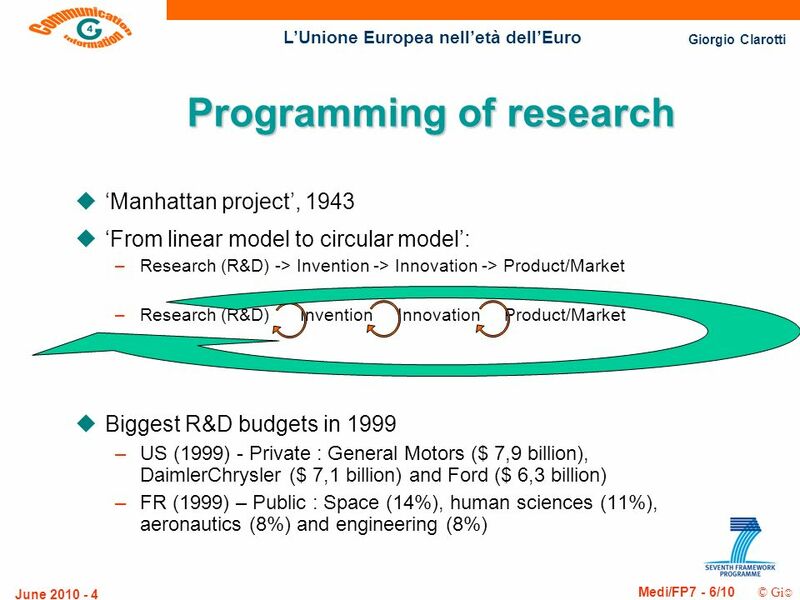 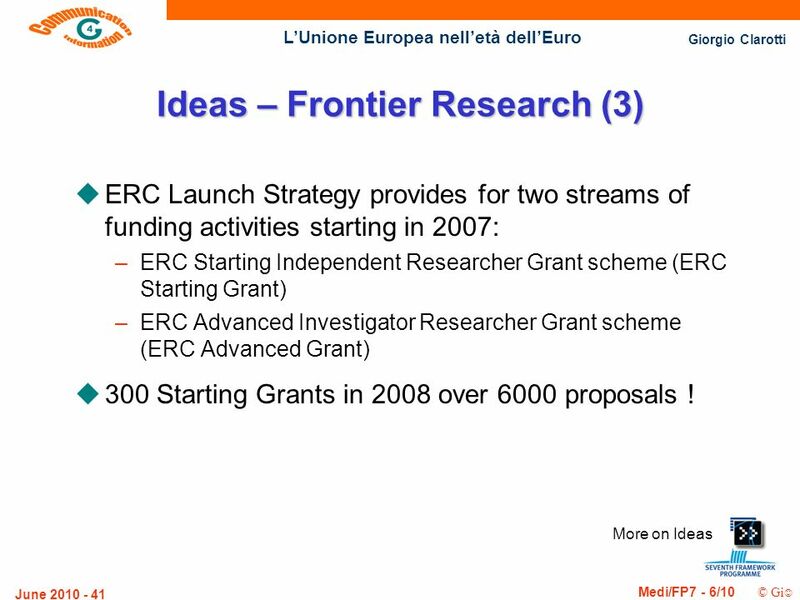 European Week of Regions and Cities – October 13th, 2005-Federica Roffi How can Regions be more involved in Research and Innovation? 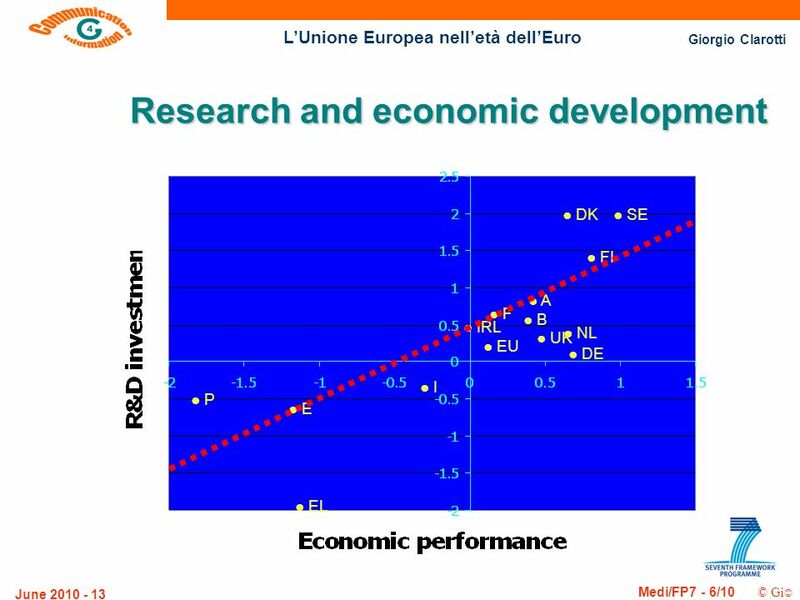 REGIONS OF KNOWLEDGE. 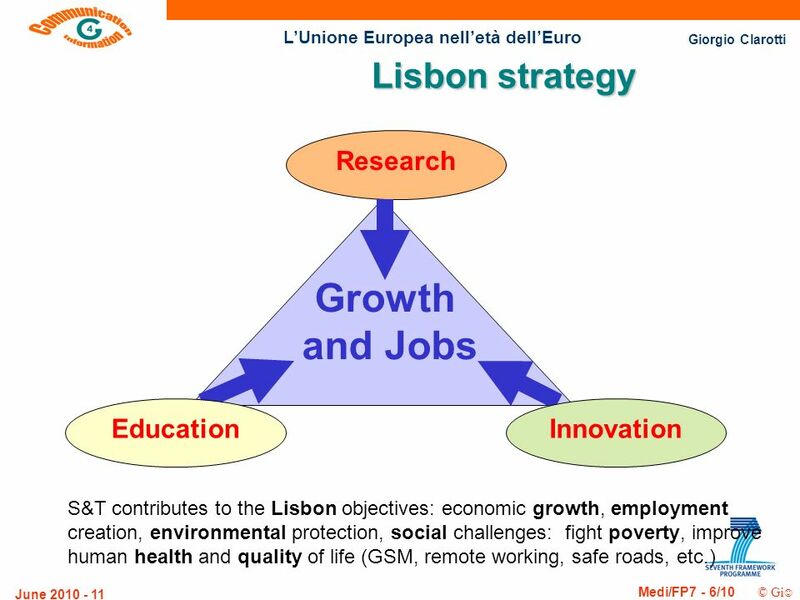 Regional Policy EUROPEAN COMMISSION Regions delivering Lisbon through Cohesion Policy Press Briefing by Regional Policy Commissioner Prof. Danuta. 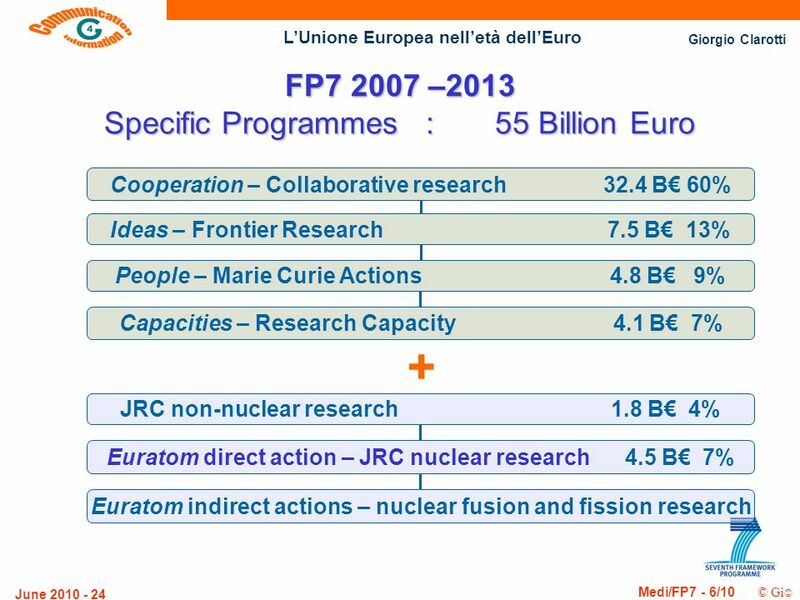 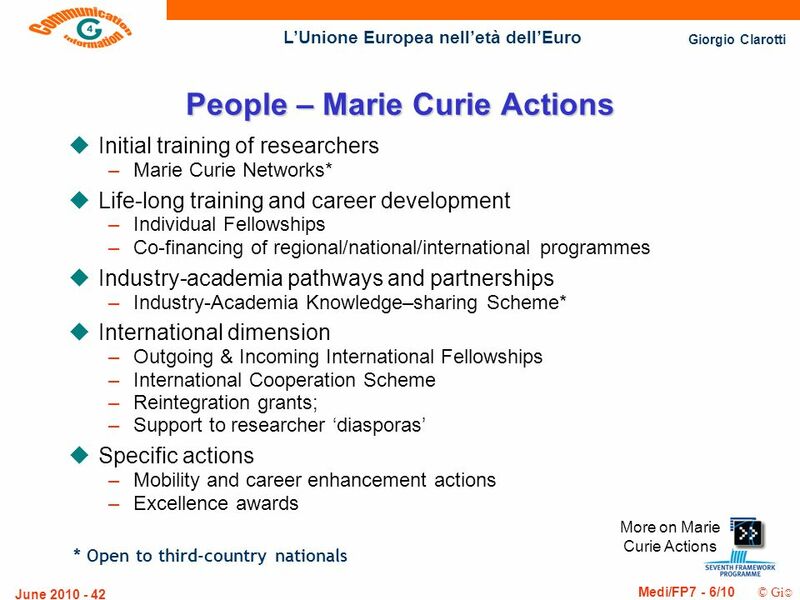 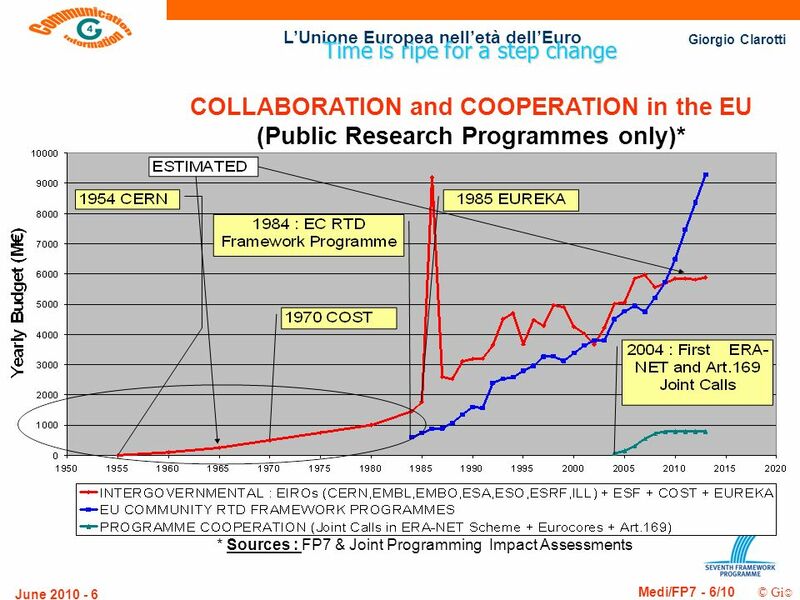 EURATOM RESEARCH AND TRAINING ON NUCLEAR ENERGY. 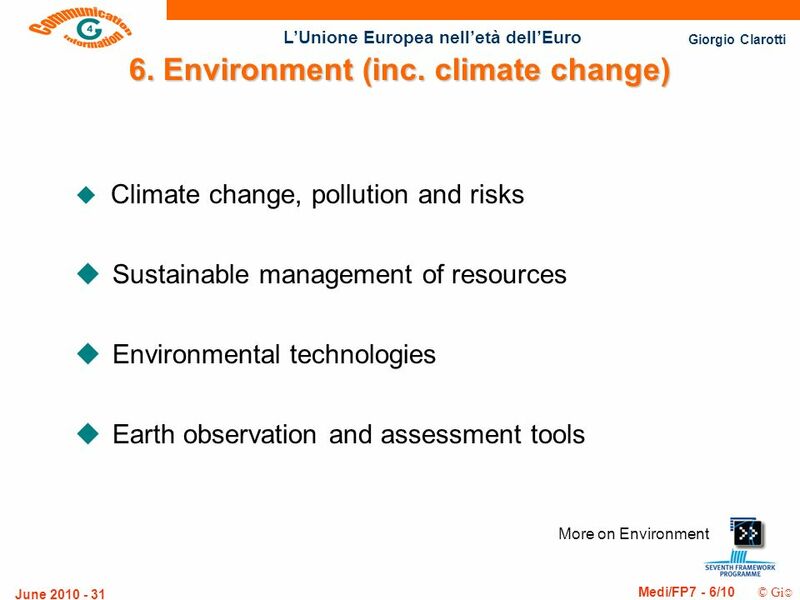 Introduction Waste management and disposal is a responsibility for the present generation benefiting.